Land Rover is counting down until the launch of the all-new Range Rover Evoque. The updated baby SUV will make its debut on 22nd November at an event live in London. Evoque first debuted in 2010 and made quite an impact at launch, something which JLR promises the latest generation vehicle will do too. Ahead of the launch next week the carmaker has introduced a number of art installations across the Capital. 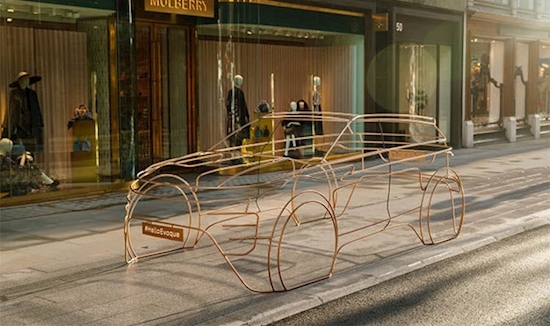 The wire structures reveal the outline of the new car and are a 1:1 scale representation, meaning that the size and shape of the car are being unveiled. It retains the fast roofline and rising waistline that is characteristic of the Evoque. From the sculpture, the car is also getting a similar air intake design as the one seen on the Velar. It is also likely to borrow some of the stunning interior design elements of the Velar with a dual screen simply in the centre console. Gerry McGovern, Land Rover Chief Design Officer, said: “The wire forms have been created to preview the new Evoque – which is the embodiment of Range Rover’s modernist design approach. Prices for the car are expected to start upwards of £30,000, however, no official pricing has been confirmed yet. Over 750,000 examples the current model have been sold worldwide. The car's specs and design will be unveiled in full next week.